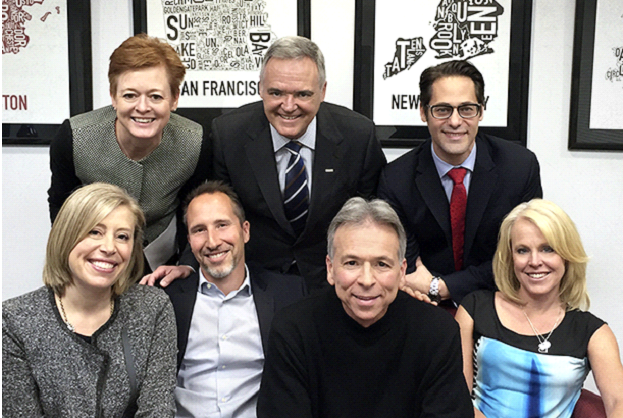 NEW YORK, NY, MAY 6, 2016 – Gould+Partners is pleased to announce that it represented SHIFT Communications in the transaction between NATIONAL Public Relations and SHIFT Communications, an integrated communications firm with offices in Boston, New York City, Austin and San Francisco. NATIONAL’s acquisition of SHIFT, which was officially announced Wednesday, brings together Canada’s top public relations firm and what’s considered one of the most innovative PR agencies in the U.S.
Front row from left, from SHIFT Communications: Amy Lyons, Managing Partner; Todd Defren, Founding Partner; Jim Joyal, Partner; Paula Finestone, Executive Vice-President, Operations. Second row from left, from NATIONAL Public Relaions: Valerie Beauregard, Executive Vice-President; Jean-Pierre Vasseur, President and CEO; Royal Poulin, Executive Vice-President and CFO. In the last 40 years, NATIONAL has grown from a two-person Montreal shop to a 550-employee, 17-office enterprise across North America and Europe, according to Andrew Molson, chairman of NATIONAL Public Relations. SHIFT Communications, which was launched in 2003 by principals Todd Defren and Jim Joyal, now has around $20 million in annual billings and a diverse roster of clients including McDonald’s, Orchard Supply Hardware and Whole Foods Market. SHIFT will retain its name, leadership team, marketplace agenda and geographic footprint following the transaction. The communications agency has a robust technology practice and seeks to bring “data-driven PR” to life. Last year, for example, SHIFT entered into a strategic agreement with Google to become a Google Analytics™ Certified Partner (GACP). The agency also specializes in B2B technology, consumer lifestyle, consumer tech and health care. “I have worked with Todd, Jim and the SHIFT team for many years as a consultant and always respected their drive and ongoing thought leadership,” Gould said, adding that he worked closely with NATIONAL’s Chairman, President and CEO on a consulting project several years ago where he was able to familiarize himself with NATIONAL’s corporate culture and the PR marketplace in Canada. Gould also has worked with NATIONAL’s leadership in Montreal and Toronto through his connection with the Canadian Council of PR Firms and Gould+Partners’ annual benchmarking surveys.